It is hard to imagine what had happened to Fatima*. It is hard to describe the silence that swallowed the voices of the spectators of her death. I think the artworks on Facebook which had returned her head, portraying it as an orchard of flowers, a moon or a sun, tried hard to compensate for this horrifying silence, and to relieve Fatima, relieve her beloved ones, and relieve all of us. What can be done for a little Syrian girl who had “lost” her head?! What can be said to a little girl who had laid down on the ground in her dress, opening her arms, her small bleeding shoulders stuck directly to the wall..? Fatima Meghlajj did not understand what had happened to her. She suddenly lost her head; she suddenly lost the ability to dream and concentrate. She wanted to feel the dryness of her throat to ask for water, but she could not. She wanted to call a mother or a father, but neither did she find her tongue nor images of parents in her memory. She tried to look around to ensure that she sleeps in a familiar safe place, while waiting for the end of this weird feeling of emptiness that stormed her, but neither did she find her scattered eyes, her eyebrows nor her eyelashes that had dispersed around the space of the cold room. She did not even find the braid of hair that her mother had combed when preparing her for her uncle’s wedding that night. An artillery shell tore it off, allowing it not a moment to say goodbye to its Owner, or to apologize for having to take her words, songs, smiles, tears and drowsiness with it. The Tyrant loves the people without heads. He loves them without voices, dreams, or aspirations. He sees them as mere hands, clapping and standing by to kill for him. He sees them as mere feet walking behind him to their fate. The Tyrant loves the children without heads. In their heads, thoughts do not know fear and words never want to commit suicide. Fatima’s head was full of colors and laughs. He thus tore it out. Those who stood silent in front of the uprooting of Fatima’s head must touch their heads every day. They must touch their children’s heads. They have to remember that a maroon hair, white teeth, and eyes which were looking for fun, have all faded away, not allowing the tender little body to gather them up and rejuvenate itself with them. 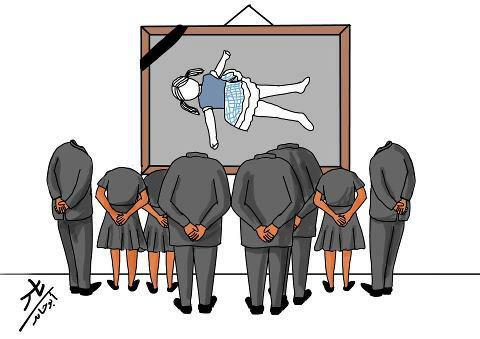 Fatima the little girl personifies the Syrian tragedy today. Her decapitated death is a daily death that claims the lives of dozens of the Syrian men and women, under the nose of the world, and in front of those who are angry, accomplices, hesitant, and powerless. * Fatima Meghlajj is a little Syrian girl who was killed in the village of Kafr-Aweed (Jabal Zawyeh [Zawyeh Mountain] region) by the shelling of the regime’s air force. Many photos and videos show her body lying on the ground, without a Head. هذه المقالة كُتبت ضمن التصنيف إلى الإنكليزية, صحافة. 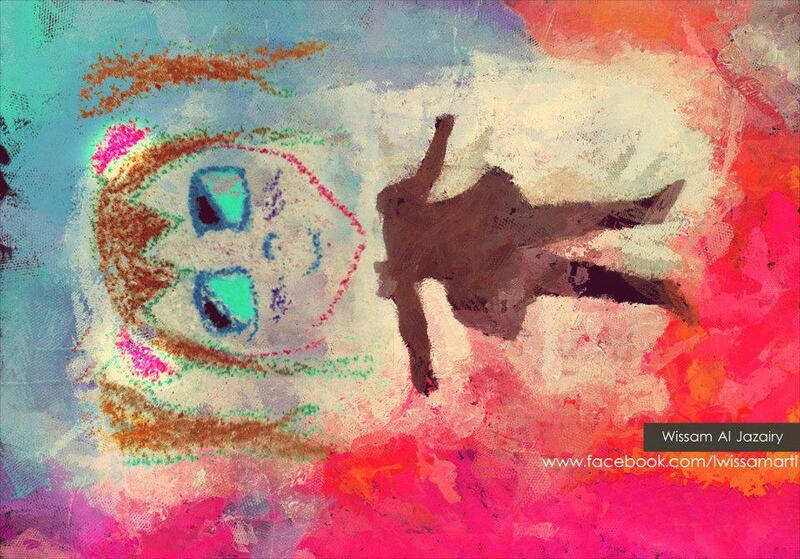 الوسوم: arts, cartoon, Children, civilian deaths, Fatima Meghlajj, silence, tragedy, Ziad Majed. أضف الرابط الدائم إلى المفضّلة.